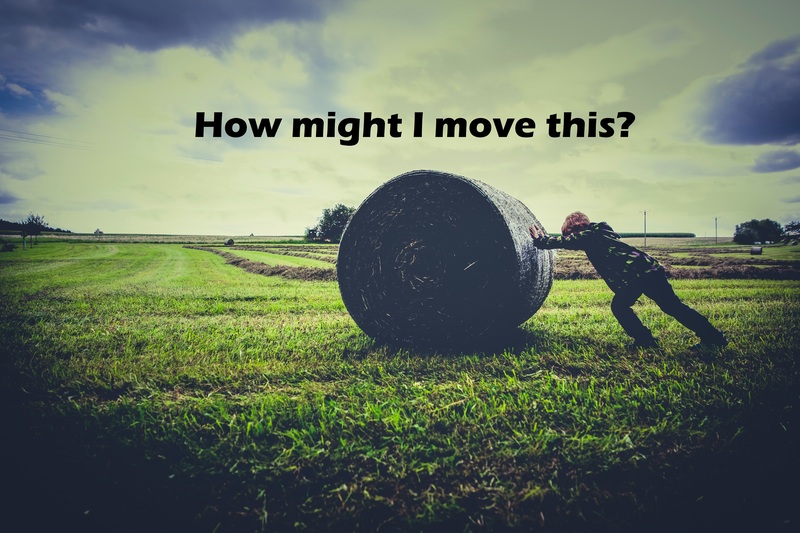 The Psychology of “How Might I…”? Last week I ran a conference call sharing a goal setting framework that has helped my wife and I make massive changes in our life, and achieve things that seemed impossible – it helped us buy an apple orchard when we have no farming background, have never owned our own company, and we are under 35. Frankly, I am amazed that we were able to translate our passion for what was possible into an outcome. And the single biggest way we achieved that was by shifting our goal setting mindset. In this post, I’m going to share the most important part of that framework. Most goal setting programs start with having you define a desired outcome, one that’s measurable and observable. We could have set a goal of “We are buying the orchard”. But, I know if we had set that goal, we would have failed – and the reason is in our biology. We people set big goals, there’s a risk involved. Anyone who has ever done anything new, whether it’s new to them, or new to the world, has faced the uncertainty from wondering if their goal is possible. Everything from the breaking the 4-minute mile, to the Penguins winning this year’s Stanley Cup, to Facebook becoming a business worth billions of dollars: the key players had a faith it was possible, but there was just as much risk and doubt to be faced too. Sherman the tortoise loved to run, but he was always last in every race. No one wanted to race him because he was too easy to beat. “Maybe, maybe not,” said Isabel. “On your mark. Get set. Go!” Isabel shouted, and the race was on. Isabel could have run right past Sherman, but instead she stayed just behind him. Sherman looked over his shoulder. I am beating her, he thought. We was so excited that he ran faster. Isabel stayed right behind him. Whenever Sherman turned and looked, he saw she had almost caught him. This made him run even faster. By the time he made it halfway to the tree, he was a blur of speed! Sherman saw that Isabel was still right behind him. He gave it all he had. When he reached the tree, he was running so fast, he ran a whole extra mile before he could stop. “Did you let me win?” asked Sherman. Looking inside the human brain, when we think that we might not be successful, our dopamine levels drop. Dopamine is a neurochemical that is used to predict our outcomes – it rises if we predict something will go well, and drops if we think things won’t go well. A drop in dopamine causes us to feel discouraged, which tells us to stop trying (or at the very least will reduce our efforts). Even if you aren’t intentionally attempting to “sabotage” yourself—even if you have the most useful mental training methods, a drop in dopamine will negatively impact your performance. This is what you see when sports teams shut down late in a game – the team that’s loosing will start to feel panicked and pressured (increases in stress hormones, reducing the creativity and field of vision of the athletes making it harder to make good team plays) AND they also will start to question if it’s possible for them to win causing them to perform slower and more carelessly. Game 2 of the NBA finals is a perfect example – watching Golden State play was watching a team play, while the Cleveland Cavaliers were fighting with themselves. By the third quarter, Golden State was loose, relaxed, and having fun. The Cavs struggled to connect, despite some excellent defence and occasional good offence. They didn’t sabotage themselves: these guys are better then that. But, by the third quarter, they had to work against their biology to keep up a pace and energy. This is all due to dopamine levels. Now, bringing this back to the idea of setting VERY BIG GOALS for yourself – if you set a goal that you know has a high probability of failure, your brain is going to respond accordingly with a drop in dopamine. Your energy levels will drop, your motivation will drop, you’ll be less creative, less resilient, and generally perform much worse. A lot of books, blogs, coaches and self-help experts describe this as “self-sabotaging beliefs”; but that suggests that as an individual you are intentionally trying to make your life harder. In reality, we aren’t self-sabotaging, but our biology is fighting us. There are three ways to approach setting big goals that you want, but don’t know if they are possible. As I mentioned above, most goal setting programs recommend you state your desired outcome. Instead, try flipping it into a question. For example, my wife and I didn’t proclaim that “we are buying an orchard”, but approached it as a question: “how might we get a bank to trust us that we are a good investment.” This shift gave us a healthy focus because we were looking at a clear question we could research, and get useful advice on. And, every time we approached a bank and eventually got a no (it happened three times, and almost a fourth), rather than it being a sign that our goal was flawed, we were able to receive this as information saying we hadn’t found our answer yet. It’s much easier to mentally process a “no” through the lens of “our hypothesis was wrong”, rather than feeling like “someone is preventing me from achieving my dream.” The first one allowed us to start over with only a little disappointment, rather than feeling like we were helpless. In sales, one of the most important skills you will develop is learning to receive a “no”. A good sales person has learned to acknowledge that a failed sales attempt says nothing about the individual, and everything about the situation. If a sale person takes every “no” personally, they are going to burn out, or quit in a big hurry. As an individual, all I can control is myself and my actions. I can choose what path I want to take, I can choose what I want to learn, I can choose who I approach for help (and who I don’t approach for help). Continuing with the sales example, if you are trying to sell something that you think is truly worthwhile and will help people, every no is one more data point to help you learn about whether you either have the wrong target market or the wrong pitch. By letting go of the need to get a yes, you get more data much quicker because you can approach more people with a consistent positive energy. You learn from what you’ve done – and you don’t internalize this experience as if it’s a sign the you are a failure. By letting go of the outcome and focusing on the process and the work necessary, you will be able to keep going when things feel risky. Back to my own experience – when we looked at buying the apple orchard, we saw it as an opportunity to create work-life blend, and have a space that would allow our whole family to thrive. It would give space for our daughter to run and play, space for my wife and I to create, and also create an income that enabled us to live lives that were more meaningful then the desk jobs we were living. The goal of buying the orchard was nothing less than claiming a value that our family was as important as how we earned money to support that family. Most people often say that their family is more important than their work – but then watch how many people miss important moments because of an important work deadline. We were taking a risk, in order to take real action to place our family higher in our priority list. For both my wife and I, that was a huge motivator. Our values are deep emotional motivators. When you set big goals that align with deepest values, they are something you intrinsically want to fight for. Your brain will actually create the conditions to support you recover from setbacks or even failure. So, even if you are experiencing a drop in dopamine from a setback, making you feel like there’s a high probability of outright failure to achieve your goal, by placing a metaphorical stake in the ground for your deepest values, you short-circuit the parts of your brain that would hold you down and you start to engage with your heart. I don’t know if there is science to back this up, but I know when I’ve made efforts that are true to my heart, I give my best effort. I may not always be successful, but I have done a job that I am proud of regardless of the outcome. And that helps me grow, and builds even more self-confidence. And, more often then not, when I’m giving an effort that’s true to my heart – I have always had a higher level of success. So, what is the goal that you’ve been thinking about, but too scared to claim? How might you frame it as a question? I would love to hear your goals in the comments – together we can be braver, stronger, and create a world that we all are passionate about. Previous If your big goal doesn’t scare you, it’s not worthy of you.